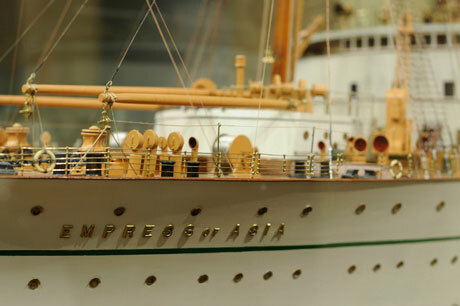 Model of the Empress of Asia ship in the Chung Collection Exhibition room. The Wallace B. Chung and Madeline H. Chung Collection is an outstanding collection of archival documents, photographs, books and artifacts related to three broad themes: British Columbia History, Immigration and Settlement and the Canadian Pacific Railway Company. Donated in 1999 by Drs. Wallace and Madeline Chung, the Chung Collection is held at UBC Library’s Rare Books and Special Collections. View thousands of images online! Or, visit the free exhibition. It is open to visitors year-round in Rare Books and Special Collections, Irving K. Barber Learning Centre, Level 1, 1961 E Mall, Vancouver, B.C. For hours and location, please visit the Rare Books and Special Collections website. Learn more from their website, or view the brochure online.